Native Americans Turning the Tide Against Diabetes - American Indian Health Service of Chicago, Inc. The progress in reducing kidney failure among Native Americans has happened since the IHS began using team-based approaches to diabetes and kidney care. The tribal elder at Fort Berthold Reservation in western North Dakota had struggled with his diabetes for years. His blood glucose level was about twice what’s considered normal, his blood pressure was dangerously high, and he was overweight. His health care provider talked to him about the need to address his diabetes and he was included in the tribal clinic’s diabetes registry, so they wouldn’t lose track of him. But he just didn’t take the steps necessary to manage his condition. Until one day, it apparently clicked. Jared Eagle, Director of the Indian Health Service’s Special Diabetes Program for Indians (SPDI) at the reservation in New Town, said the man finally started taking advantage of the resources and care provided through the clinic. He started walking more; lost 20 to 30 pounds; and reduced his blood glucose and blood pressure levels. “You can see him walking every day. He’s walking his dog every day, even in the winter,” Eagle said. The story of this elder of the Mandan, Hidatsa and Arikara Nation (also known as the Three Affiliated Tribes) reflects the significant progress being made in Indian Country where Native Americans have a greater chance of having diabetes and kidney failure resulting from diabetes than any other U.S. racial or ethnic group, according to the Centers for Disease Control and Prevention. 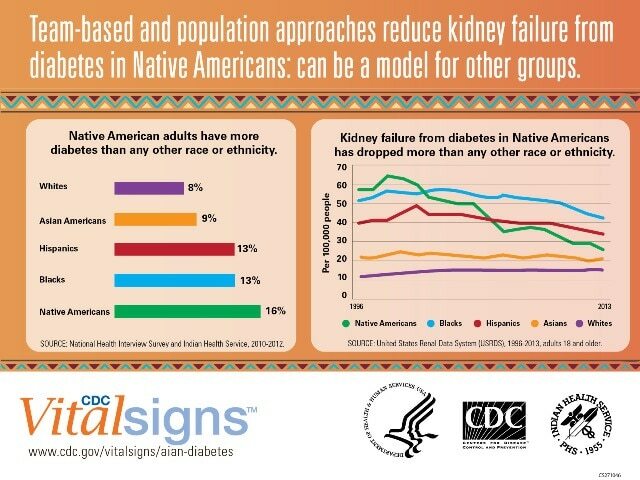 Nonetheless, the CDC also reported recently that kidney failure among Native Americans dropped by 54 percent between 1996 and 2013, the fastest rate for any racial or ethnic group in the U.S. This hard-fought improvement is particularly important to American Indian and Alaska Native communities. Kidney failure from diabetes is a difficult and costly condition that requires dialysis or a kidney transplant for survival. The progress in reducing kidney failure has happened since the IHS began using population health and team-based approaches to diabetes and kidney care, according to the CDC and IHS. SDPI helps fund IHS, tribal and Urban Indian programs in 35 states to implement diabetes treatment and preventive services. At Fort Berthold and other Native American communities, SDPI funds programs in prevention, physical activity and nutrition. Eagle said at Fort Berthold, they sponsor Zumba and Yoga classes, sports leagues and fitness centers, grocery store tours and lessons on how to can food. Eagle, a member of the Three Affiliated Tribes, said that at the rural Fort Berthold Reservation, which covers 250 square miles, diabetes initiatives have involved deploying a team to the reservation’s four field clinics to check on nutrition and diet; dental care; flu shots and other immunizations; blood glucose; blood pressure; and lab work. 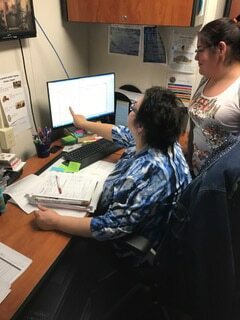 The reservation’s health center keeps a diabetes registry of about 670 tribal members so that a nurse and two medical support assistants can make sure patients get – and show up for – regular appointments and that necessary lab work is ordered and reviewed. A kidney specialist also visits patients at the field clinics once a month to assess the condition of individuals who are showing signs of progressive kidney disease. Patients can also be referred to the specialist’s home office in Bismarck, but that could be a trip of 150 miles or more for some of them. The reservation screens all school-age children to determine if they are overweight or obese. Those with a high body mass index (BMI) are then screened for diabetes, and if they show signs of being pre-diabetic, they are referred to the Healthy Futures clinic where they and their parents are provided follow-up services. The Healthy Futures clinic is administered by Shasta Mandan, the RN-Certified Diabetes Educator.